Only on audio! A brand-new, never-before-published Stephen King short story unavailable in any other format! Alden McCausland and his mother are what they call "accident rich"; thanks to an unexpected life-insurance policy payout and a winning Big Maine Millions scratcher, Alden and his Ma are able to spend their summers down by Lake Abenaki, idly drinking their days away in a three-room cabin with an old dock and a lick of a beach. Across the lake, they can see what "real rich" looks like: the Massimo family's Twelve Pines Camp, the big white mansion with guest house and tennis court that Alden's Ma says is paid for by "ill-gotten gains" courtesy of Massimo Construction. When Alden's holiday-weekend sparklers and firecrackers set off what over the next few years comes to be known as the 4th of July Arms Race, he learns how far he and the Massimos will go to win an annual neighborly rivalry - one that lands Alden in the Castle County jail. Read by beloved Down East storyteller Tim Sample - praised by Stephen King for his "wit and talent and good-heartedness" - Drunken Fireworks makes for explosive audio listening. 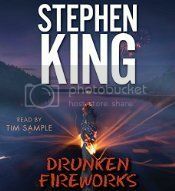 Sometimes, when King isn't trying to scare us to death, he can also be telling us some truly fantastic stories, and "Drunken Fireworks" is one of those stories. This is nothing more than two families across the lake from each other, with a rivaling fireworks problem, but the magic is in the telling of the story. This short will eventually appear in print in The Bazaar of Bad Dreams, but I doubt it will hold up nearly as well; it's Tim Sample's narration that really makes this story shine. For King fans, this will be a nice, light-hearted break from some of his heavier offerings, and for non-fans, you can experience King doing what he does best: telling a damned fine story.